An ocean (from Ωκεανός, Okeanos (Oceanus) in Greek) is a principal component of the hydrosphere: a major body of saline water that, in totality, covers about 71% of the Earth's surface (or an area of some 361 million square kilometers). Nearly half of the world's marine (oceanic) waters are over 3,000 meters (9,800 ft) deep. Average oceanic salinity is around 35 parts per thousand (ppt) (3.5%), and nearly all seawater has a salinity in the range of 31 to 38 ppt. Though somewhat arbitrarily divided into several 'separate' oceans, these waters comprise one global, interconnected body of salt water often referred to as the World Ocean or global ocean. The major oceanic divisions are defined in part by the continents, various archipelagos, and a number of other criteria; these divisions are (in descending order of size) the Pacific Ocean, the Atlantic Ocean, the Indian Ocean, the Southern Ocean (which is sometimes reckoned instead as just the southern portions of the Pacific, Atlantic, and Indian Oceans), and the Arctic Ocean (which is sometimes considered a sea of the Atlantic). Smaller regions of the oceans are called seas, gulfs, bays and other names. There are also some smaller bodies of salt water that are inland and not interconnected with the World Ocean: e.g., the Caspian Sea, Aral Sea, the Great Salt Lake. These are not considered to be oceans or parts of oceans, though some are called 'seas'. Geologically, an ocean is an area of oceanic crust covered by water. Oceanic crust is the thin layer of solidified volcanic basalt that covers the Earth's mantle where there are no continents. From this point of view, there are three oceans today: the World Ocean, the Caspian and the Black Seas, the latter two of which were formed by the collision of Cimmeria with Laurasia. The Mediterranean Sea is very nearly a discrete ocean, being connected to the World Ocean through the Strait of Gibraltar, and indeed several times over the last few million years movement of the African continent has closed the strait off entirely. The Black Sea is connected to the Mediterranean through the Bosporus, but this is in effect a natural canal cut through continental rock some 7,000 years ago, rather than a piece of oceanic sea floor like the Strait of Gibraltar. The area of the World Ocean is 361 million square kilometers (139 million sq mi), its volume is over 1,340 million cubic kilometers (319 million cu mi), and its average depth is 3,711 meters (12,175 ft). Nearly half of the world's marine waters are over 3,000 meters (9,800 ft) deep. The vast abyssal plains of the deep ocean cover about 40% of the Earth's surface. This does not include seas not connected to the World Ocean, such as the Caspian Sea. The deepest point in the ocean is the Marianas Trench located in the Pacific Ocean near the Northern Mariana Islands. It has a maximum depth of 10,923 meters (35,838 ft) . It was fully surveyed in 1951 by the British naval vessel, "Challenger II" which gave its name to the deepest part of the trench, the " Challenger Deep". In 1960, the Trieste successfully reached the bottom of the trench, manned by a crew of two men. Oceans are divided into numerous regions depending on the physical and biological conditions of these areas. The pelagic zone includes all open ocean regions, and can be subdivided into further regions categorised by depth and light abundance. The photic zone covers the oceans from surface level to 200 metres down. This is the region where the photosynthesis most commonly occurs and therefore contains the largest biodiversity in the ocean. Since plants can only survive with photosynthesis any life found lower than this must either rely on material floating down from above (see marine snow) or find another primary source; this often comes in the form of hydrothermal vents in what is known as the aphotic zone (all depths exceeding 200m). The pelagic part of the photic zone is known as the epipelagic. The pelagic part of the aphotic zone can be further divided into regions that succeed each other vertically. The mesopelagic is the uppermost region, with its lowermost boundary at a thermocline of 10°C, which, in the tropics generally lies between 700 and 1,000m. After that is the bathypelagic lying between 10°C and 4°C, or between 700 or 1,000m and 2,000 or 4,000m. Lying along the top of the abyssal plain is the abyssalpelagic, whose lower boundary lies at about 6,000m. The final zone falls into the oceanic trenches, and is known as the hadalpelagic. This lies between 6,000m and 10,000m and is the deepest oceanic zone. Along with pelagic aphotic zones there are also benthic aphotic zones, these correspond to the three deepest zones. The bathyal zone covers the continental slope and the rise down to about 4,000m. The abyssal zone covers the abyssal plains between 4,000 and 6,000m. Lastly, the hadal zone corresponds to the hadalpelagic zone which is found in the oceanic trenches. 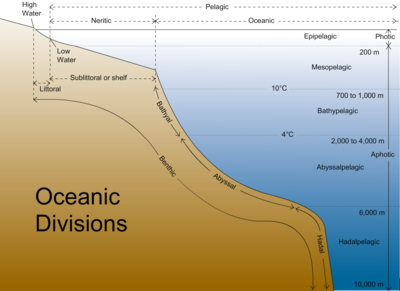 The pelagic zone can also be split into two subregions, the neritic zone and the oceanic zone. The neritic encompasses the water mass directly above the continental shelves, while the oceanic zone includes all the completely open water. In contrast, the littoral zone covers the region between low and high tide and represents the transitional area between marine and terrestrial conditions. It is also known as the intertidal zone because it is the area where tide level affects the conditions of the region. One of the most dramatic forms of weather occurs over the oceans: tropical cyclones (also called "typhoons" and "hurricanes" depending upon where the system forms). Ocean currents greatly affect Earth's climate by transferring warm or cold air and precipitation to coastal regions, where they may be carried inland by winds. The Antarctic Circumpolar Current encircles that continent, influencing the area's climate and connecting currents in several oceans. The oceans are essential to transportation: most of the world's goods are moved by ship between the world's seaports. Important ship canals include the Saint Lawrence Seaway, Panama Canal, and Suez Canal. They are also an important source of valuable foodstuffs for the fishing industry. Some of these are shrimp, fish, crabs and lobsters. Earth is the only known planet with liquid water on its surface and is certainly the only one in our own solar system. However, liquid water is thought to be present under the surface of several natural satellites, particularly the Galilean moons of Europa, and, with less certainty, Callisto and Ganymede. Geysers have been found on Enceladus. Other icy moons may have once had internal oceans that have now frozen, such as Triton. The planets Uranus and Neptune may also possess large oceans of liquid water under their thick atmospheres, though their internal structure is not well understood at this time. inundating the world with the waters of the celestial ocean (see also deluge (mythology)). One common misconception today is that the oceans are blue primarily because the sky is blue. In fact, water has a very slight blue colour that can only be seen in large volumes. While the sky's reflection does contribute to the blue appearance of the surface, it is not the primary cause. The primary cause is the absorption by the water molecules' nuclei of red photons from the incoming light, the only known example of colour in nature resulting from nuclear, rather than electronic, dynamics.